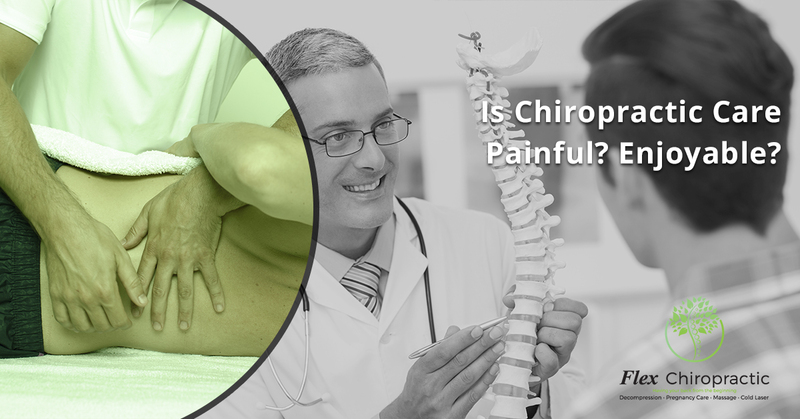 Chiropractic Care Lexington: Is It Painful? Is Chiropractic Care Painful? Enjoyable? One of the most common questions that people ask when they get to our office (or more likely one they type into Google) is “is Chiropractic Care painful?” It’s a very fair question. After all, most people associate care with pain if they have something wrong with them. Surgery is painful, shots are painful, getting a bone set is painful. So when it comes to seeking pain relief from our doctors and specialists, the idea that it could be painful is common. Does Care Received At A Chiropractic Clinic Hurt? Let’s take a look at what you might experience at our chiropractic clinic, and if each type of care can be painful or not..
Let’s start at the heart of our business: chiropractic adjustments. The entire practice of chiropractic began with the physical manipulation of the spine and neck, and millions of people have benefited from it. But is it painful? In nearly every case, no. Our adjusters have years of training and have most likely seen many patients with the same sort of pain that you’re experiencing, whether it’s lower back pain or something wrong with the neck. If there is any discomfort, it would be some minor soreness after the joint manipulation. However, such soreness is highly tolerable if it ends up relieving the painful problems you came in for. When a chiropractor performs a standard chiropractic evaluation, they are looking for subluxations (minor misalignments) of the spine. They do this by touch, and then use traditional chiropractic techniques. Because of the movement, twisting, and “popping” associated with adjustments, some people are scared to head to a chiropractor. The Pro Adjuster uses a different method to tackle subluxations. A u-shaped instrument sends painless signals through the vertebrae, taking measurements as the doctor or technician moves it down the spine. Once a misalignment is found, the same instrument is used to gently tap that spot with a rapid percussion. While you can certainly feel it, it’s not tapping hard enough to hurt. When most people think of ultrasound, the first thing that comes to mind is the visualization of babies in the womb. Ultrasound therapy is different in that the wand uses a different frequency and has no image-receiving head. Ultrasound therapy uses ultrasonic waves — sound waves that humans can’t hear — in order to stimulate cells so that they can absorb more nutrients and oxygen. Does ultrasound therapy hurt? Not at all. You can’t feel the sound waves, and the only sensation likely to be experienced is the gentle movement of the ultrasound wand on your back. When most people think of lasers, they imagine the lasers in movies that burn holes through objects. But few lasers are actually powerful enough to burn, and cold lasers are actually very useful when dialed in to the proper frequency. While ultrasound therapy uses sound waves in order to stimulate blood flow to the area in question, cold-laser therapy uses light waves to produce similar results. The lasers used produce no heat, but there may be a tingling sensation brought about my increased blood flow. Massages serve a number of purposes. Sometimes their primary goal is to reduce stress, other times to “work out the kinks.” Still some massages are undergone simply because they feel good! In general, massages at a chiropractic clinic are mostly about helping muscles recover from some sort of injury. While there might be some discomfort as the problem areas are being located, the level of pressure can be changed in order to avoid further pain. Like all chiropractic care, the minor discomforts of treatment are worth it for the relief received. Decompression therapy involves a patient lying on a table and being secured to both ends of it. The lower half of the table the slightly separates from the upper, gently giving relief to the patient’s spine. While it might sound like a scary procedure, there’s nothing to worry about and no pain involved. It’s so gentle that the only real feeling is one of relief over the weeks of the procedure. Kinesiology taping involves putting long adhesive bandages on various parts of the body in order to make some muscles work harder while giving others a break. Kinesiology tape does not hurt when it is applied, though it takes some time to get used to the way it affects your body. Getting it off can be a bit more difficult, though. It uses very strong adhesives to stay on, even if you sweat. To take it off without any sort of preparation could cause pain much like taking off the strongest band-aid you’ve ever applied! That’s why it’s important to be patient when removing kinesiology tape. Most people apply baby oil to it, let it sit for 20 minutes, and then lather it up in the shower in order to slowly peel it off. Can Care Even Be Enjoyable? Now that we’ve detailed the fact that most of the procedures you’ll experience at a chiropractic office are painless, let’s discuss some of the reasons that it can actually be enjoyable. Most of us enjoy being touched by a professional caregiver. Massage is an obvious example of this, but most patients also like the feeling of the attention they receive with ultrasounds, adjustments, and cold laser therapy. It simply feels good to relax for a while and have a professional focus on relieving you of your pain. There aren’t many medicines or procedures that give immediate relief. If your doctor gives you antibiotics, it can take days before you see a difference in your health. If he or she tells you to lose weight for your health, it takes months of eating right and exercising. Some of the procedures at our chiropractic clinic can give immediate relief. Chiropractic adjustments can reduce stress on the spine, often reducing pain considerably once the patient sits up. Cold laser therapy can help increase blood flow, and massage therapy leaves many of our clients feeling great. It’s just so nice to leave our chiropractic clinic feeling better than when you came in! As we mentioned before, for the few people who don’t like the “popping” aspect of a chiropractic adjustment, the Pro Adjuster is probably the right method of care for them. Most people, however, really quite enjoy a bit of popping! Many people crack their knuckles, and we all know how satisfying popping bubble wrap can be. With a typical adjustment, the popping sound is a definite indication between before and after, not only giving physical relief but also giving an audible cue that something has indeed occurred. We’re happy to report that, in most cases, chiropractic care isn’t going to be painful. If you experience any pain or discomfort at all at all during your chiropractic care, it’s going to minimal, and we’ll make sure to tell you that it’s coming. When it comes to chiropractic care, it’s much like many procedures that you might experience in life. For example, it might be uncomfortable to have your teeth cleaned, but it will prevent tooth decay in the future. And it’s so worth it! The minor discomfort you could experience during your time with a chiropractor will end up leading to less pain in the future. Contact your local chiropractors in Columbia and Lexington today!